It’s been a while since I posted about some of the bikes we see around town, which is misleading because I see more family bikes every day. Red Bullitts are so thick on the ground that I think they might have their own gang. Who knew that going with a blue Bullitt would be so passé? And I’m still trying to get a picture of the CETMA I see near our son’s school sometimes, but the dad riding that bike is just too fast for me. In the meantime, there are others. This Surly has the motor on the front wheel, along with the clever wheel lock. 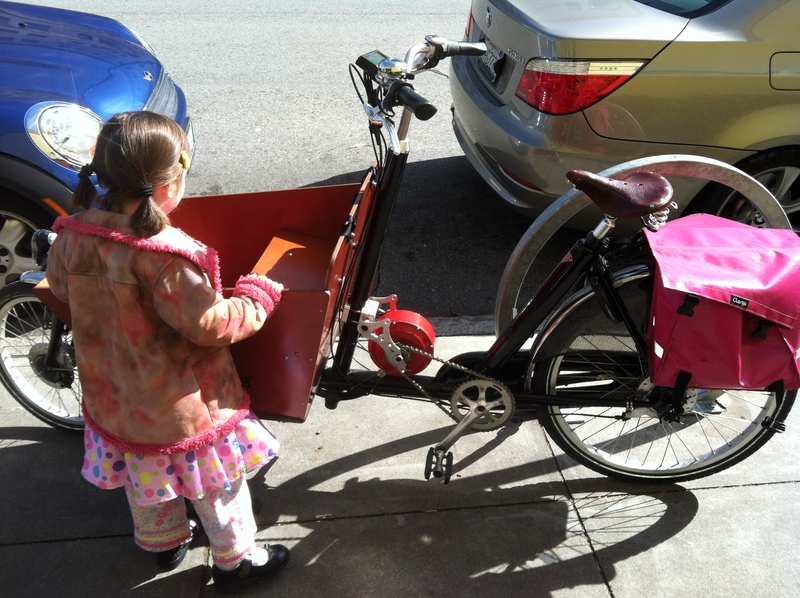 The most common family bike we see is an assisted longtail, like this one. The EdgeRunner made a big splash in SF, but there are also a lot of pre-EdgeRunner Xtracycle options running around the city. I liked this assisted Surly because I thought the front wheel lock was a clever addition. The family riding this bike parked it outside the Jewish Community Center while we were there for an event with only the wheel lock, so they didn’t need a rack. I thought that was tempting fate when I first looked at it, but realized that without the need for a rack, they could park right in front, in full view of the security guard standing at the door. The bike was still there after our 3-hour event, and I saw it parked there again a week later, so it was evidently safe enough. This Bakfiets short belongs to our neighbor up the hill, and is well-known in the city because the owner works for the San Francisco Bicycle Coalition, which is a totally awesome organization to which we donate an increasing amount of money every year. I am grateful for their tireless efforts to create world-class bicycle infrastructure here, and that infrastructure is a big part of the reason that I get the opportunity to photograph many awesome family bikes. Thank you, SFBC! I tell all my friends to join! The Stokemonkey (now back in production!) is a recent addition, which made it possible to ride up the hills around here with kids on board. I was surprised that she reported that it is kind of noisy, given that I had heard it was silent. But if it kills the hills, it’s probably worth it. 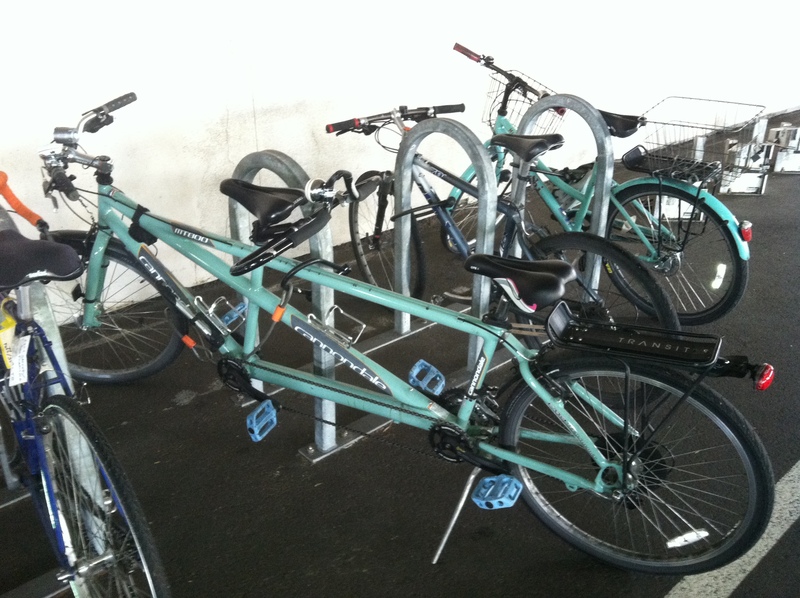 This Cannondale tandem appeared recently at the bike rack at my office. It’s been there every morning for the last few days at least. It looks like it might be set up for two adults, or maybe an older kid. I’m surprised it has so little carrying capacity—just one rack for two people? But maybe as kids get older you end up hauling less crap around as parents. That would be something, wouldn’t it? I like big bikes (and I cannot lie) but the prospect of being able to ride a lighter bike one day… I admit, this has some appeal. Stokemonkey is kind of noisy on box bikes because the box acts as a resonator/amplifier for the low vibrational sound of the motor itself. 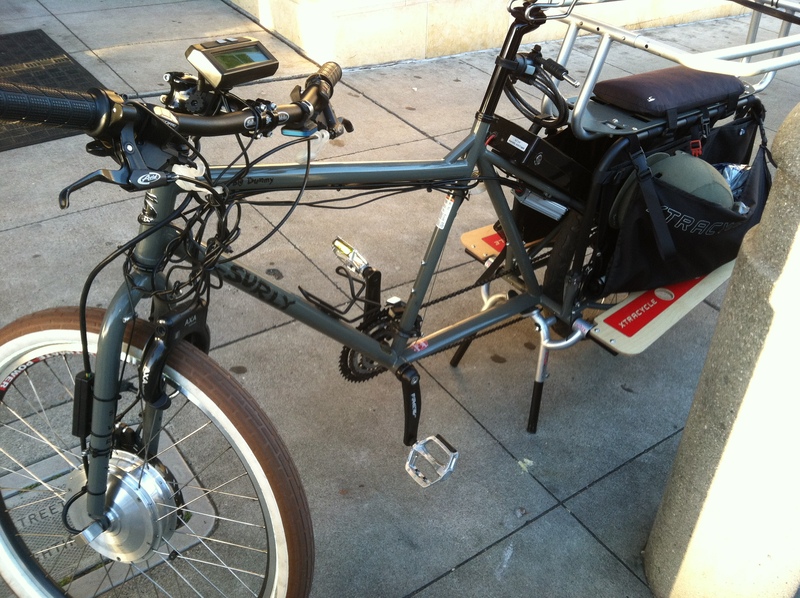 Surprised to see Stokemonkey’s clamp mount work on that generation of Bakfiets.nl Cargobike. If the owner is reading this, can you say whether you needed some custom machining or other special tricks to make that happen? Also: strongly recommend upgrading those roller brakes to model IM-80 or at least IM-70 (I think those are IM-50 on there now), and keep on top of brake grease condition. Even in less-hilly Portland we’ve seen stoked Bakfiets.nl Cargobikes have their lower-spec roller brakes fail, resulting in scariness and expensive frame damage, which is why we (the Stokemonkey people at Clever Cycles) decline to install SM on this particular bike. I had the clampset machined through http://www.emachineshop.com/ based on the one sold by http://www.ebikes.ca/; I just made it 1/8″ wider to accommodate the larger tubing. The brakes are IM-70s. We’re aware of the issues you’ve seen; we ride the bike conservatively and keep the brakes greased. Thanks for the recommendation though. Thanks, Todd, I’ll ask them to check in when I see them next. This was helpful information. I’m getting lots of “should I get a StokeMonkey or BionX for my bike?” questions lately, which I don’t really feel qualified to answer. I use a Bike Friday Tandem with my now 9 year old son. There is just one rack with grocery panniers. I use the panniers, and his backpack is strapped to the top of the rack. We only use the tandem during good weather though.